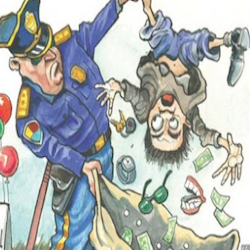 Civil Asset Forfeiture legislation needs to be reformed in order to protect innocent people from having their property subject to legal theft by the state without due process. R3publicans (R3s) are working to help Oklahomans learn about this issue and what they can do to help reform the current law. The senate author of the bill to reform Civil Asset Forfeiture law in OK (SB-838) is Senator Kyle Loveless. Our hope is that public support for reform will be strong enough to ensure that this bill is heard in the upcoming legislative session and ultimately passed and signed into law. Civil Asset Forfeiture Reform is an issue everyone can get behind regardless of political leaning. Handout includes several counties and the amount confiscated and kept over recent years. It also include a Washington Post op ed on topic.This information is for sharing with friends, family, neighbors, and elected officials. Please let your representatives know your thoughts on the matter. Previous Previous post: EX-IM Bank Reauthorization: Crony Capitalism or National Security?